Salvatore Accardo is an outstanding Italian violin virtuoso, best known as a master of the works of Niccolí² Paganini, but equally accomplished across a wide variety of repertory for the instrument. His playing is characterized by a taut, visceral tone and a disciplined musical approach that avoids self-indulgence. Having also established himself as a successful conductor, chamber musician, and teacher, Accardo may be considered one of the most accomplished and influential musicians of his generation. Accardo was born in the northern Italian town of Turin, but as a teenager he went to Naples to study violin at the Conservatorio di San Pietro a Majella; it was there, at the age of 13, that he gave his first performance of the devilish Caprices of Paganini, beginning a lifelong association with that music. He later studied in Siena, at the Accademia Musicale Chigiana. After winning the 1956 Geneva Competition and the 1958 Paganini Competition in Genoa, Accardo began a performing career that has kept him busy ever since, both as a soloist with major orchestras and as a recitalist. His repertory includes all of the violin music of Paganini, the solo partitas of J.S. Bach, virtually every mainstream violin concerto from the Classical, Romantic, and Modern eras, and a number of contemporary works. Works composed specifically for Accardo include Walter Piston's Fantasia for violin and orchestra, Iannis Xenakis's Dikhthas, and Franco Donatoni's Argot. The most notable entries in Accardo's extensive discography include his complete cycle of Paganini concertos (the first of its kind), Max Bruch's complete music for violin and orchestra, and the complete sonatas and partitas of Bach. In 1968, he founded the Italian Chamber Orchestra and became its first conductor. He later conducted the ensemble I Musici, and in 1994 he was appointed conductor of the Orchestra del Teatro San Carlo in Naples. 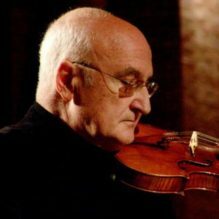 He is a founding member of the Accardo String Quartet and of the Walter Stauffer Academy, where he routinely gives master classes, and also of the Cremona Academy for string players. In 1987, he published a book, L'arte del violino.